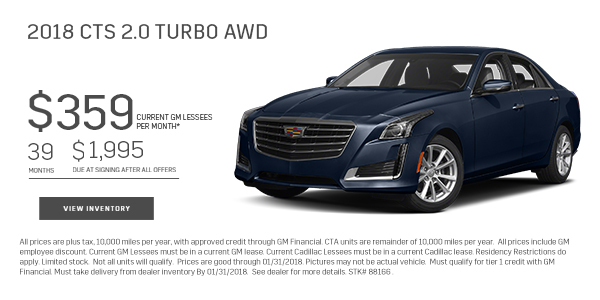 Ann Arbor based Suburban Cadillac has new sales incentives on ATS, CTS, CT6, Escalade and XT5 models to start the 2018 New Year. We have launched the new year with sales incentives on the luxury brand of vehicles. The 2018 new car models include ATS, CTS, CT6, Escalade and XT5 with down payments as low as $1,395. 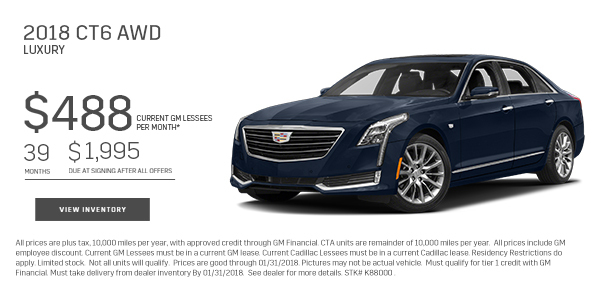 Suburban Cadillac of Ann Arbor (http://www.suburbancadillacofannarbor.com) has launched the new year with sales incentives on the luxury brand of vehicles. The 2018 new car models include ATS, CTS, CT6, Escalade and XT5 with down payments as low as $1,395. 2018 ATS 2.0T AWD Luxury for $279/month for 24 months with $1,995 down at signing after all offers. Mileage charge of 25 cents per mile over 20,000 miles. 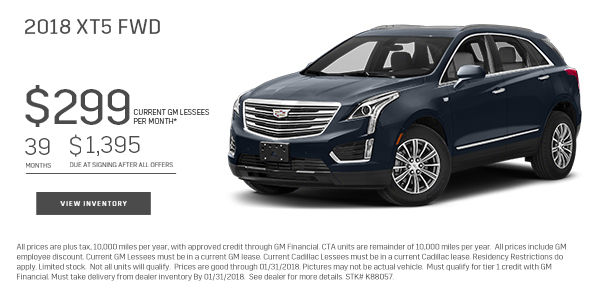 2018 XT5 FWD for $299/month for 39 months with $1,395 down at signing after all offers. Mileage charge of 25 cents per mile over 32,500 miles. 2018 CTS 2.0 Turbo AWD for $359/month for 39 months with $1,995 down at signing after all offers. Mileage charge of 25 cents per mile over 32,500 miles. 2018 Escalade 4WD Luxury, $819/month for 36 months with $1,995 down at signing after all offers. Mileage charge of 25 cents per mile over 30,000 miles. 2018 CT6 Luxury AWD Courtesy Transportation Vehicle with 3,026 miles, $488/month for 39 months with $1,995 down at signing after all offers. Mileage charge of 25 cents per mile over 32,500 miles. All vehicles ultra-low mileage leases for well-qualified lessees. No security deposit required. Amount down at signing plus first payment, tax, documentation, plate transfer, acquisition fee. All prices are plus tax, 10,000 miles per year, with approved credit through GM Financial. CTA units are remainder of 10,000 miles per year. All prices include GM employee discount. Current GM Lessees must be in a current GM lease. Current Cadillac Lessees must be in a current Cadillac lease. Residency Restrictions do apply. Limited stock. Not all units will qualify. Prices are good through 01/31/2018. Pictures may not be actual vehicle. Must qualify for tier 1 credit with GM Financial. Must take delivery from dealer inventory by 01/31/2018. See dealer for more details. Suburban Cadillac of Ann Arbor offers a wide range of pre-owned and certified used cars for Ann Arbor Cadillac drivers. Our Cadillac vehicles undergo a 117-point check before being put out for sale, and the vehicles also come with a warranty and an auto-check certified history. We also provide concise financing options for pre-owned and certified used cars. 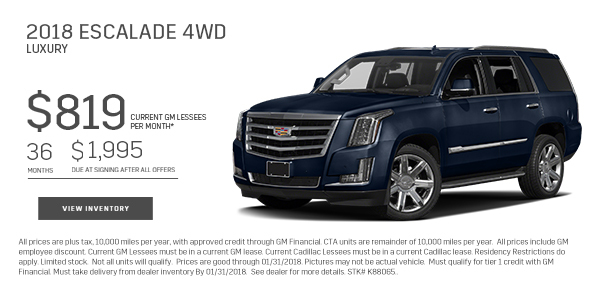 You can find the most recent pre-owned certified vehicle offers on the Suburban Cadillac of Ann Arbor website. Suburban Cadillac of Ann Arbor has Certified Service for the care of your Cadillac. You can rely on our technicians to possess expert knowledge of your vehicle, from its detailed stitching to the curves of its frame. “When was the last time you got your oil changed or brakes checked? If you can't remember, then it's probably time to bring your vehicle down to the pros at Suburban Cadillac of Ann Arbor,” asks general Manager Michael Mosser. You can find service specials on the Suburban Cadillac of Ann Arbor website. Suburban Cadillac of Ann Arbor is located at 3515 Jackson Rd Ann Arbor MI 48103 and you can contact them at +1 (734) 659-0670 for sales and +1 (734) 794-3768 for Service. Additional information can be located on the Suburban Cadillac of Ann Arbor website. We're particularly proud of our 4.8 rating at DealerRater - the premier automotive dealer rating service. Over 100 customers have spoken up on our behalf. DealerRater has over 700,000 reviews, and gets over 850 new reviews every day! With over 109 years of combined experience our management team is sure to be able to find a fit for you. Our General Manager - Michael Mosser and our Sales Managers - Bob Kanerva, Mina Boles, and Scott Greene along with John Millard our Service Manager and the rest of the management team at Suburban Cadillac are here to assist you and make sure your experience at Suburban Cadillac is nothing short of amazing!